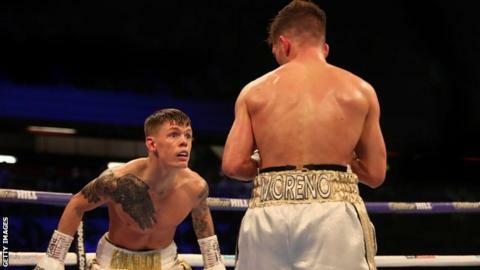 Charlie Edwards vowed to "build a legacy" after a dominant points win over Angel Moreno in his first defence of the WBC world flyweight title. Britain's Edwards, 26, proved too slick throughout the bout and forced a count when the Spaniard touched down with his glove in the eighth round. Moreno proved game but never looked capable of hurting the champion, who won 120-107 on all three scorecards. "I am going to be a multi-weight world champion, mark my words," said Edwards. "I am obsessed with this game, with bettering myself day in day out. This was a different feel tonight and my boxing IQ has gone up 10 fold. I want to build a legacy. "He's a great fighter and tough so I knew he'd be there until the end but it was a punch perfect, clinical boxing performance." Edwards had sparred his 35-year-old opponent in the past and Moreno seemed keen on a battle at London's Copper Box Arena when he beat his chest in round one, only to quickly walk on to the type of punishment that would consistently follow. The champion, chastised by his corner for showboating in the fourth, landed a right hand to put his rival down in eight and an eye-catching right uppercut a round later. Edwards, who claimed his title by beating Cristofer Rosales in December, never looked under serious threat, showcasing energy and stamina over the 36 minutes, while comfortably dealing with Moreno's come-forward style. Elsewhere at the Copper Box, 2016 Olympic bronze medallist Joshua Buatsi continued to show off a classy style as he landed the British light-heavyweight title with a third-round stoppage of Liam Conroy. Buatsi, 26, timed a counter-right hand to get his rival in trouble and clinically followed up with a savage right hook to end the contest. Lawrence Okolie, his fellow Team GB 2016 Olympian, secured the British and Commonwealth cruiserweight titles by stopping Britain's Wadi Camacho inside four rounds. Newcastle's Lewis Ritson returned from the first defeat of his career to score a unanimous decision over Argentina's German Argentino Benitez. Ritson, who stepped up to super-lightweight for the bout, declared himself unhappy with the display, which was controversially given to him by a wide margin, with the three scorecards reading 99-91, 98-92 and 98-92. Meanwhile, at Leicester Arena, Tommy Fury - the younger brother of former world heavyweight champion Tyson - took just 94 seconds to score the second win of his career, stopping Callum Ide. Sam Bowen defended his British super-featherweight title by stopping Jordan McCorry, while British heavyweight Nathan Gorman extended his unbeaten record to 16 fights with a points win over experienced American Kevin Johnson.